On January 15th I attended the 20th Anniversary of the LA Art Show Premiere party. Located at the LA Convention Center, the show kicked off with a star-studded benefit for St. Jude Children’s Research Hospital®, which is close to my heart. St. Jude is leading the way the world understands, treats and defeats childhood cancer and other life-threatening diseases. When treated here, families never receive a bill from St. Jude for medical, travel, housing or food, because all a family should worry about is helping their child live. I had the opportunity to visit the hospital last April to see first hand what is provided for these children and it’s amazing! Hosted by Amy Adams and Darren Le Gallo, the opening night premiere party welcomed more than 5,000 celebrities, philanthropists, collectors, and art patrons. There was so much beautiful, cool, unique, mesmerizing art to look at that you need the full 3-4 hours to go up and down every aisle to catch it all an absorb it! Anything colorful caught my eye, along with things I had never seen before or things that look unreal. 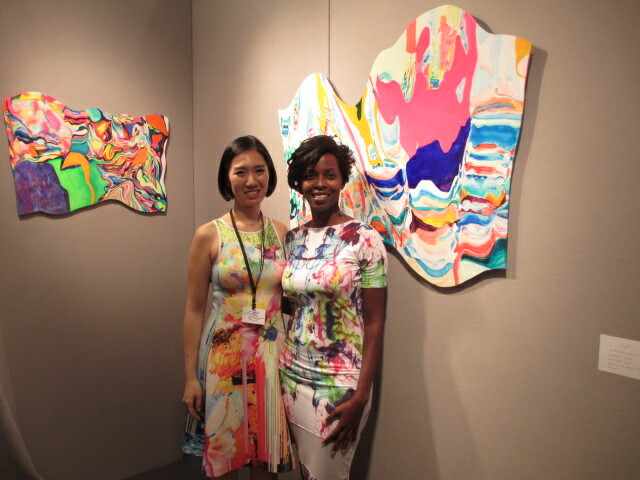 One of my favorites was the acrylic paintings of Eugnia Song. Her mixes of color were spot on and they were very unique! The LA Art Show took place from January 15-18 at the Los Angeles Convention Center, South Hall. If you were able to attend, what were some of your favorite pieces? For additional information about the LA Art Show, please visit www.laartshow.com.